To commemorate reaching the 1 billion user milestone, Facebook released its first ever ad – an uncharacteristic move for the social network – that showcases the many ways and reasons people are using Facebook. 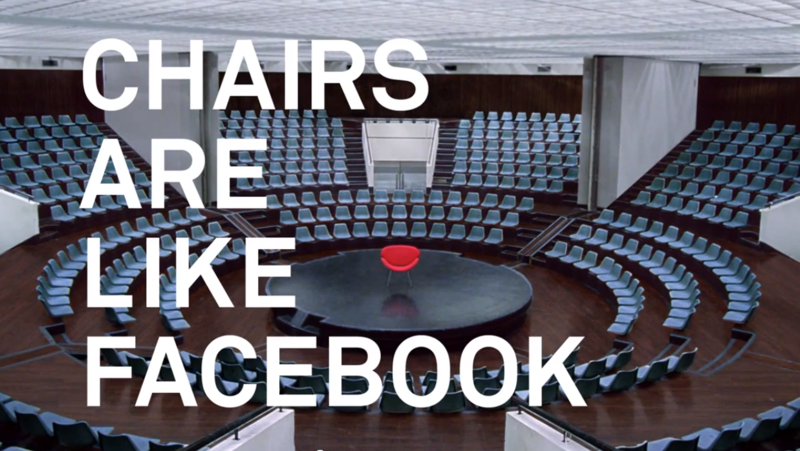 The minute and a half branded clip, titled “The Things That Connect Us,” illustrates how Facebook is a platform for connecting with people using some heavy-handed metaphors involving chairs, doorbells, bridges, and even airplanes. “These are things people use to get together so they can open up and connect about ideas, and music, and other things that people share,” the video says. The “chairs” allusion tries to explain how we’re grounded when we sit and the situations in which this leads to interactions, whether you’re sitting on a bench, at a table, or in a classroom. As apt as Facebook might find this metaphor to be, the Internet is collectively giving the ad a big blank stare — thanks in part to the fact that it begins with the chair reference and somehow makes it way to comparing Facebook with the universe. We’re all for hyped, overkill promos like this, but Facebook may have overshot just a bit. Despite any criticism, the company is busy celebrating its new user numbers. As we reported earlier, Zuckerberg has gone on media tour today with appearances on NBC News and a Q&A with Businessweek. A hackathon will also be held to mark the network’s 1 billion users. With the inevitable billion finally reached (and just to put this figure into perspective, this means that approximately one in seven people in the world are now on Facebook), there will likely be some changes coming to the platform. Zuckerberg has already hinted at his vision for the company during an interview with Businessweek.“I think there’s about to be a big push in commerce,” Zuckerberg explained, which has already started with the launch of Facebook Gifts. Check out Facebook’s ad below and let us know what you think.